US, 1951, 74 minutes, Colour. Stephen Mc Nally, Coleen Gray, Arthur Shields. 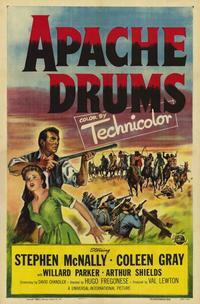 Apache Drums is one of those many small supporting feature westerns made by Universal during the '50s. The stars appeared in many films of this kind. Of special note is Barry Fitzgerald's brother Arthur Shields, who portrays yet again a minister. However, he is the mouthpiece of prejudice about the Indians and of the superiority of Christianity over 'heathen religion'. In the atmosphere of the early '50s with films like Broken Arrow, he changes his attitude after the experience of siege by Indians. The siege of the Welsh mining settlers in the church is quite frightening. 1. An interesting and entertaining western? Conventional material? In comparison with other treatments of the same theme? 2. Colour photography, desert locations, the town, the open plains, the special effects for the Indian siege? Musical score? 3. The plausibility of the plot: the Welsh miners and their migration to America, their community sense, religious beliefs, traditions e.g. in the singing especially during the siege? The role of the Apaches ? their being herded by the government, their rebellion, their attacks? Their religious beliefs and fight for survival? The gunfighter gambler hero? Romance? Heroism? 4. The picture of the town - its work, pioneer settlement? The dance hall? The sheriff and his work as blacksmith? Upholding the morality of the town? Sending the girls to another town? Getting rid of the gunslinger gambler? The minister and his influence? The reaction to the Indian attack? Waiting for the military? Deaths? The siege? Thirst? Deaths? The rallying of spirit? 5. The picture of the Indians: the initial explanation, the injustice to the Indians, their being on the warpath, the sieges? The minister and the hero defending themselves and wounding the chief? The religious beliefs and drinking for immortality and death? The reckless giving of themselves in death? The request for a doctor for the chief? The death of the sheriff? The film's comments about the plight of the Indians, the attitudes of the pioneers? The strong words of the minister and his condemnation of the Indians? His change of heart? 6. The gambler hero, shooting, love for the heroine, going out of town, the encounter with the Indians, his not being believed, his return, help? His redeeming himself? The heroine and her being torn between the two men? The sheriff and his uprightness? His heroism in the siege? His death? 7. The minister and the film's strong emphasis on the clash between Christianity and Indian religions? Racial superiority? The impact in the '50s, later decades and civil rights questions? His change of heart? The importance of the Indian guide who helped the white settlers? His being humiliated by the townspeople, the drinking of beer in the saloon, his prayers? The point about the God of all people? 8. The details of life in the town, the riders for the military, the military Captain and his command of the post, his being wounded and his strategy for the defence? 9. A realistic picture of the times? An entertainment glimpse? Part of the heritage of American western films?